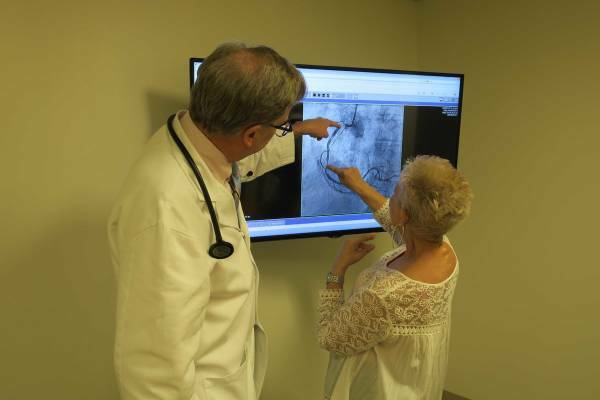 Four times, Elaine Paparella Vandeputte underwent balloon angioplasty to clear dangerous blockages in her right coronary artery, usually also having stents implanted to prop open the vessel. Four times, the vessel became blocked again, clogged with scar tissue and other cells that were part of her body’s attempt to heal. In August, physicians at Thomas Jefferson University Hospital tried a different tack: a targeted dose of radiation inside the artery to inhibit the regrowth of cells. So far, it seems to have worked. The 73-year-old South Philadelphia woman pronounced herself full of energy, with none of the shortness of breath that sent her to other hospitals so many times before. "I feel absolutely fantastic," she said. The technique, called brachytherapy, works by damaging the DNA in what’s known as smooth-muscle cells to prevent them from multiplying as part of the healing response. It was developed more than a decade ago to treat patients with bare-metal stents whose arteries became reclogged. It fell out of favor with the advent of stents that are coated with drugs to prevent these repeat blockages, called restenosis. But now physicians are getting interested in brachytherapy for the small number of patients in whom drug-coated stents do not work, said Jefferson cardiologist Michael Savage. "After you’ve had 3 layers of stents in there, if the stents aren’t working at that point, it’s time to think of other options," Savage said. Brachytherapy also does not work for everyone. But Vandeputte was glad to have it as an option, given that she otherwise might have needed bypass surgery. Though restenosis is no more common in women than men, Vandeputte’s crash course in cardiology began in June 2014, when she suffered a heart attack while recovering from a hysterectomy at Pennsylvania Hospital. Physicians there inserted two drug-coated stents into her right coronary artery, and she felt good at first. A former smoker with high cholesterol, she adopted a heart-healthy diet and focused on staying active. Nevertheless, 10 months after her heart attack, she started to feel increasingly short of breath. One day it got so bad that friends put her in an ambulance back to Pennsylvania Hospital, where she got another stent. Seven months later, in November 2015, it happened again, and physicians placed two more stents. Then in May 2016, she went in for a stress test at Lankenau Hospital and learned the artery was once again nearly blocked. Physicians reopened the vessel with balloon angioplasty but did not put in another stent. Instead, they mentioned the possibility of brachytherapy, which they said was offered at hospitals in New York and Washington, D.C., Vandeputte recalled. Upon conducting an internet search, she found that Jefferson offered the procedure, too. So in August, when she suffered unstable angina, she was ready to try it. Going in through an artery in Vandeputte’s left wrist, Savage first inserted a slender device equipped with a laser to cut away some of the blockage. Then he inserted a balloon to expand the vessel. The radiation was the final step, administered by radiation oncologist Robert B. Den with a special catheter made by Best Vascular Inc. of Norcross, Ga., part of the TeamBest family of companies. He depressed a syringe to push a short chain of radioactive isotopes through the opening in Vandeputte’s wrist all the way up to her coronary artery. The radiation is more intense than that in a chest X-ray but is delivered to a very small area, just a few millimeters long, and does not harm surrounding organs, Den said. He left the isotopes in place for a few minutes, then drew them back out. Before the procedure, the coronary artery looked as if it had been pinched in several locations, almost like when a circus clown twists one of those long balloons to make a funny shape. But the most recent angiogram, an image of the coronary artery taken in November with X-rays, showed the vessel wide open along its entire length. Most important: it has been five months since the procedure, and Vandeputte feels good. But physicians still need to keep an eye on her. In a recent study of 186 such patients who underwent brachytherapy at MedStar Washington Hospital Center, 12 percent had experienced a repeat blockage at 1 year. Jefferson’s experience has been similar, with one out of 10 such patients experiencing a repeat blockage, Savage said. "It doesn’t take a lot of tissue to reclog the pipes, so to speak," Savage said. Exactly why restenosis strikes is not always clear. Vandeputte’s problem may have been exacerbated by scar tissue, caused by radiation treatments she had received for Hodgkin’s lymphoma decades earlier. Vandeputte is optimistic and maintains a busy social schedule, often walking to restaurants and other outings with friends in South Philadelphia, even in the coldest temperatures. "It’s freezing, but I’m able to breathe," she said recently. "So thank you, Lord. I’m not complaining about the cold!"